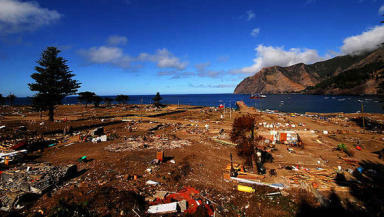 Largo area is twinned with Robinson Crusoe Island - which was devastated by a recent earthquake and tsunami. The Scottish hometown of the "real" Robinson Crusoe has launched an appeal to help the tiny Pacific island where he was marooned for over four years rebuild its only school after it was swept away by a devastating tsunami. Daniel Defoe based his book, Robinson Crusoe, on the life of Scottish sailor Alexander Selkirk, who was born in Lower Largo, in Fife. The Largo area was twinned with Robinson Crusoe Island - formerly Mas a Tierra - in 2004 to celebrate the 300th anniversary of the village's famous son Selkirk being marooned there. Now the two disparate communities have come together after the tropical island 400 miles off the coast of Chile was left devastated by a recent earthquake - which caused a five-metre high tsunami to sweep over the island. It destroyed many buildings on the island, populated by around 650 people, including its only school that served 120 children. Largo Area Community Council has set up an appeal to help the Gabriela Mistral Foundation in trying to raise $500,000 to rebuild the islanders' school. Community council chairman Peter Aitken said the appeal has already gathered momentum, with almost £5000 already being raised. He said: "The island school has been destroyed and requires to be rebuilt with the British Ambassador to Chile becoming patron of the project to rebuild the island school. We hope to involve both Lundin Mill and Kirkton of Largo primary schools in the project to rebuild the school on the island. "At a public meeting I asked the audience to imagine the situation if the disaster had befallen Largo how grateful we as a community would be to have the support of the islanders of Robinson Crusoe Island, in the rebuilding of our community." MEP Struan Stevenson hopes that the people of Largo will help contribute with the rebuilding effort after the tsunami struck in February. He added: "Jon Benjamin, the British Ambassador to Chile recently agreed to a suggestion by the Mayor of Isla Robinson Crusoe to become Patron of the project to rebuild the school. "The ambassador says that he is closely in touch with Peter Aitken, chairman of the Largo Area Community Council, about next steps, including involving the two primary schools there." The seventh son of a Lower Largo cobbler, Selkirk was born in 1676 and went to sea as a young teenager. In 1704, during a privateering voyage on the Cinque Ports, Selkirk fell out with the commander over the ship's seaworthiness and he decided to remain behind on island, where they had landed to overhaul the worm-infested vessel. He cannot have known that it would be four years and four months in isolation before he was picked up by a passing English ship. Published in 1719, Defoe's book Robinson Crusoe is one of the oldest and most famous adventure stories in English literature. Newspaper reports of Selkirk's exploits made him a well-known figure, though it is unclear whether Defoe ever met him. He died of yellow fever in 1721. A bronze statue commemorating him stands outside his former home on Lower Largo's Main Street.